Everyone is weighing in on the Orlando nightclub shooting event of Sunday June 12, 2016. Mainstream and alternative media, pundits, bloggers, editorials, writers, YouTubers and more. We are all talking about the event and to begin with, this is one important point and deliberate intention of the event, to get us focusing on it. But that is not what this article is about. Events staged for political purposes are reaching a form of perfection when it comes to getting the agenda through. What am I talking about? Let's review the recent Orlando shooting event from the top and see what agendas it serves. 7- Reinforcing the ISIS psyop which they (the West and its NATO allies) created themselves and is the lifeline of the new world order. 9- Distracting the public from the Bilderberg 2016 get together which was occurring at the time. These are just some of the ongoing agendas playing out in real-time, designed to steer the masses into believing certain narratives which are ultimately important for the ruling elite to obtain their final goals. With that said, now let's strip the veil from the Orlando shooting false flag "investigation" and reporting period which has followed the shooting event. After being shown images and witness testimonies that lacked the full 3-dimensional reality as I outlined in my initial report, the mainstream media lying machine and the politicians quickly jumped on the "ISIS did it" script. Within practically minutes we were told shooter Omar Mateen called 911 himself and confirmed he was doing this for ISIS who he "pledges allegiance" to. This is just a revision of the "manifesto" tactic they usually put out. The controllers know that many of us (including myself) were waiting for the usual manifesto and they delivered the manifesto in broad daylight, simply in another form. From this point on it seems the main point of this false flag event was accomplished because the whole point was to connect this event (as they did with the San Bernardino false flag) to ISIS with or without proof. But as usual they don't have proof of this connection right? Actually, this is where I firmly believe the psyop begins so I urge all truth seekers to pay attention. I have no doubt that Mateen or someone using this name is likely a patsy of some kind documented in FBI previous operations and investigations. Examples of mainstream media admitting the Mateen connection to FBI and or other agencies are here, here and here. Truth seekers should stop, think and take notice that even the mainstream media was eager to admit that the shooter had previous ties to FBI. Ask yourself, why would the mainstream media themselves so quickly admit this? Another important observation I see is that one document reported by one website often begets hundreds of articles about the same document throughout the internet. Think about that. That said, okay so the trail to Mateen, the patsy of choice, and his connection to FBI is important and seems credible but there's more to this. Let's go in another direction as we explore this topic further. According to today's New York Times, a top secret unit of military intelligence identified four of the 9/11 hijackers as Al-Qaeda members in the summer of 2000. In the summer of 2000, the military team, known as Able Danger, prepared a chart that included visa photographs of the four men and recommended to the military's Special Operations Command that the information be shared with the Federal Bureau of Investigation, the congressman, Representative Curt Weldon of Pennsylvania, and the former intelligence official said Monday. Reading and carefully considering this report provided by what at the time mainstream media told us was a "top secret unit of military intelligence" we have to now step back and consider a few things. This is the same mainstream media that to this day won't look at WTC 7's destruction or any of the ties to the criminal elements financially linked to 9/11. This is the same mainstream media that told us they found Mohammad Atta's fully intact passport on the streets of New York City after surviving 3000-5000 degree heat from the explosive plane crash. And the same mainstream media unwilling to face the countless list of impossibilities and bizarre coincidences that point the blame back to the Bush Cheney criminal cartel. This same untrustworthy news source at the time was now willing to admit that al-Qaeda terrorists were indeed training in the US and even learning to fly planes in Florida. What does this all mean and how does it all tie back to the recent shooting event in Orlando? I urge truth seekers to be careful of "Intelligence" information put out by FBI and mainstream media that is designed to make you believe that what happened was due to "Intelligence failure". Haven't we heard this many times before? Yes, truth seekers will see these anomalies as confirmation of a false flag and we should know about these anomalies, but the sheeple will see this as a sign of intelligence failure and thus ... confirmation that the event was real! As in a real "ISIS" (or in the case of 9/11 al-Qaeda) threat that could perhaps have been stopped with more police state and surveillance state tactics. I see this as a clever way to introduce some truth (of corrupt staged terrorism) to use as a tool of mass deception, in this case to sell us on the idea that ISIS is real, that they really are here and that they are somehow a major threat to Americans. This will only benefit the US Military Industrial Complex and their thirst for more endless war in Syria and in the Middle East in the name of fighting ISIS. In addition to the fact that the Orlando shooting event is all being delivered in the artificial 2-dimensional reality with things like no real bodies shown to us, no blood, no cell phone videos of the actual shooting, little to no ambulances or footage of any actual professional rescue workers saving lives, we're being asked to simply accept the event as real and move on to the political consequences and "solutions". But hold on for a minute. Consider this wild proposition. What if we are all being played in ways we haven't considered. For example, no one is saying that no one died. But what if this is what they are hoping to lure truth seekers into believing? Consider that the evidence they are showing the public would actually imply that maybe they are hiding something and that possibly no one died, but let's all stop to think. What if creating confusion is the plan? Why is the mainstream media afraid to show the action shots of what really happened inside the club and instead are showing us the same 3 or 4 almost staged victims being carried away? Are they purposely trying to create the confusion luring truth seekers into declaring that no one died when in fact people died? If so, this would be the perfect way to make fools out of truth seekers wouldn't it? Are you still with me? 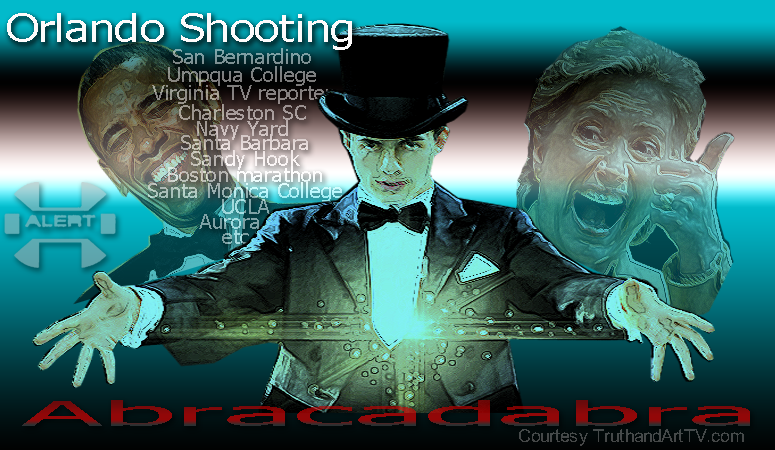 So, I can't help but to notice that as the controllers get better and better at staging these mass shootings which come in different varieties, they will often contribute themselves to pieces of "information" that actually have dual effects of both showing us it's fake as many fine writers and contributors in the alternative media have pointed out to us regarding the shooter's ties to the FBI etc, but to also actually endorse the "reality" of the event. This is a win-win situation for the controllers who have in previous false flags revealed much more details without seeing any threat to their story imposed. For example, the controllers let slip out 2 distinct takes of the Virginia TV reporter shooting of Alison Parker in August of 2015 without any harm to their story in the eyes of the general public. They also allowed absolutely conflicting stories about the identity of the shooter as well as the number of shooters when they pulled off the San Bernardino false flag, and we don't have to go over the long list of obvious anomalies with Sandy Hook. I could go on and on but the point is that in the new reality we are living in, anomalies are acceptable because the system can work with these anomalies and move on. They already know they can get away with huge mistakes and still sell their "event". Recall Sandy Hook psyop "doctor" Carver basically telling us all to our faces that he hoped this event wouldn't come "crashing down on the people of Newtown". It didn't and the Sandy Hook crisis actors did get away with it. We are living in a new reality and everyone must pay attention and stop falling for the bits and pieces of "information" the controllers are willing to let you figure out. This is my main message and warning to all. Yes we know it's possible the accused patsy had ties to FBI, we should expect this. And yes we should expect the usual FBI-terrorism connection and failed "sting" events. But in the larger picture all of this is just details of the same script that they have planned for us. This is a script and a plan that the controllers are now very good at. They are way ahead of humanity and in order to fight the information war we are in we must come above them and know all (not some) of their tactics. Knowing what their goals and agendas are is a good place to start. So in this sense I believe everyone (even including myself) is being fooled in some way by this latest psyop shooting event as we try to wrap the event around our minds and make sense of it. Again, remember, the controllers are way ahead of us. In the words of the 'smoking man' of the old TV series 'X-Files': "Trust no man Mulder ... "